Join us at the MIDFLORIDA Auto Show! This is our second year participating in the event - and we're back! 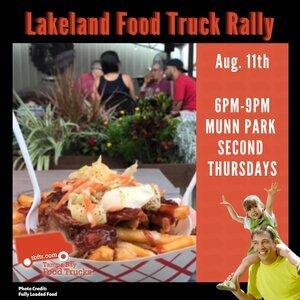 We'll have a great array of trucks for the show including Manolito's Cubans, The Rolling Gourmet, Jimmy's Famous Seafood, The Dude & His Food, Mr C's Grilled Cheese, and Chief's Chillout! This is a FREE event with FREE parking! Come for a display of over 750 cars surrounding Lake Mirror in Downtown Lakeland. The event will be running from Friday-Sunday, but our food truck service will occur on Saturday from 10am-2pm. We will see you there!